These three taxa from the late Eocene and early Oligocene of North America may be closely related and are thus discussed together in this section. Procrax brevipes Tordoff and Macdonald, 1957 is based on a dissociated post-cranial skeleton from the late Eocene (Chadron Formation) of South Dakota. The species was initially placed into the Gallinuloididae, which were considered to be most closely related to the Cracidae by Tordoff and Macdonald (1957). In contrast to the humerus of the Gallinuloididae, however, the robust humerus of Procrax lacks a marked second pneumotricipital fossa, and there are also numerous other differences in the postcranial skeleton features. As far as comparisons are possible, the bones of Procrax resemble those of the Paraortygidae. 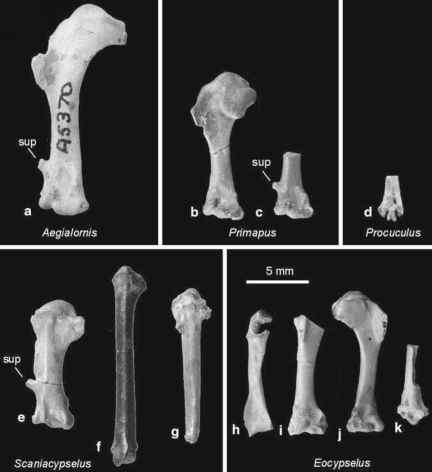 P. brevipes was somewhat larger than the males of the extant Chaco Chachalaca, Ortalis canicollis, and differed from all extant Cracidae except Pipile in the proportionally shorter legs and ungual phalanges (Tordoff and Macdonald 1957). In contrast to that of the Gallinuloididae and Quercymegapodiidae, the minor metacarpal of the carpometa-carpus is markedly bowed, and unlike in Paleogene Phasianidae, this bone lacks an intermetacarpal process. From the published illustrations, I conclude that P. brevipes is closely related to, if not conspecific with, the equally sized A. sibleyi Crowe and Short, 1992. The latter species is known from a humerus from the early Oligocene Brule Formation of Nebraska, and was not differentiated from P. brevipes in the original description (Crowe and Short 1992). On the basis of morphometric comparisons, A. sibleyi was considered to be most closely related to the Phasianidae by Crowe and Short (1992); however, the absence of a transverse ridge in the capital incision clearly shows that the species is outside crown group Galliformes. Apart from being somewhat stouter, the humeri of Procrax and Archaealectrornis match well with that of the paraortygid Pirortyx major. Palaeonossax senectus Wetmore, 1956 from the early Oligocene Brule Formation of South Dakota was described as a member of the Cracidae by Wetmore (1956). This species is represented by a distal humerus and also needs to be compared with Procrax and Archaealectrornis to which it appears to be quite similar, judging from the published drawings. The Cracidae thus have no unambiguously identified Paleogene record.